You'll be £25.00 closer to your next £10.00 credit when you purchase Japanese Battleships 1897–1945. What's this? This photographic archive contains some 125 stunning images of the battleships of the Imperial Japanese Navy, many unfamiliar, some very rare. They constitute an archive that is pretty much without equal in publications in the West. Just as the ships were lost, so were the majority of photographic records, and relatively few images have come down to us. This selection from R A Burt's archive, represents therefore a remarkable portrayal of these ships, and the large format of the book combined with the quality of many of the images ensures that it offers the reader maximum detail and visual impact. Extended captions and ship specifications enhance its reference value and it is destined to become a 'must-have' volume for enthusiasts and modellers and for all those with an interest in the Second World. In combination with our "Dossier" n. 43, by E. Martino, dedicated precisely to the Japanese battleships and in distribution starting from the current month of May, is an iconographic source of good interest for the many students of the history and technique of these fascinating ships from a bygone era in naval history. A masterpiece without a doubt. books on British capital ships. Instead it charts the rise and ultimate annihilation of Japan as a major naval power through the image of the capital ship. images is accompanied by crisp text in the form of cations and extended captions. Most recommended. The author has a solid reputation for his work on the design, construction and service of British battleships. has provided the basis of the collection of Japanese battleship images reproduced here. Burt covers each of these ships in their original configuration and through their massive reconstructions. The most obvious visual change in most cases was the construction of the famous 'pagoda' bridge structures, but there were many internal changes as well, allowing many of these ships to perform a valuable role decades after they were first built. Japanese military secrecy of the late 1930s means that later pictures are rarer, and many 1940s pictures are from the point of view of their American attackers, but Burt had found enough good pictures to illustrate each of these ships. The pictures are supported by useful captions and by clear plans showing the changes to the more dramatically altered classes. Contains some 125 stunning images of the battleships of the Imperial Japanese Navy, many unfamiliar, some very rare. This photographic archive is a record of the capital ships of the Imperial Japanese Navy from FUJI, Japan's first real battleship. During the period covered by this book, Japan became the world's third largest navy being armed by Britain until just before the outbreak of the First World War. An excellent collection of archive photographs covering the period when the Imperial Japanese Navy grew rapidly to the height if it's power, only to be reduced to virtually nothing by the end of WW2. Japan had not historically been known for ocean going naval power before the 1800's, and as an island nation had focused more on coastal shipping. That was a contrast to the likes of Great Britain where ocean going naval ships had grown along with the growth of the British Empire. So when they looked to expand the Japanese Navy it was to the UK in particular that the Japanese turned for shipbuilding experience. As a result, some of their early battleships were built in the UK, and these are illustrated in this very useful photographic record of the Japanese Battleships of the first half of the twentieth century. They also put captured Russian vessels back into service under new names and there are examples of these as well. The Japanese were very quick learners, and they quickly began to build ships of their own. Modern designs, powerful weaponry and some interesting designs. There are instances where older ships had modifications during refits, some of which included adding length to both bow and stern as well as other changes in their profiles. There are also things like the fitting of the aircraft deck at the stern end of the Ise and her sister ship while at the end of the book we see the two largest battleships ever built, the Yamato and the Musashi. In the end, the sheer weight of numbers of the US Navy smashed most of these fine ships into submission. One or two of those still afloat at the end of the war ended their lives as test vessels in the Atom Bomb tests at Bikini Atoll after the war. Lots of basic details about each ship, and their stories for each class of vessel and an excellent selection of photos for anyone interested in the IJN of WW2. A must-have volume for enthusiasts. This book takes a pictographic look at every class of Japanese battleships created between the years, 1897-1945. As we know, many photographs of the Imperial Japanese Navy were lost, this was mostly during the Second World War. Mr Burt has compiled over 130 of the majority of remaining photographs, reproduced and laid them all out in this book. The book follows these battleships chronologically, many of the photographs have been beautifully rendered some spanning a two-page spread and are accompanied by text. R. A Burt's Japanese Battleships 1897 - 1945 takes a fantastic look at these grand ships of the Imperial Japanese Navy, spanning almost fifty years. The included line drawings are a nice addition, showing the various changes made to the four major classes of ships that took part in WWII. 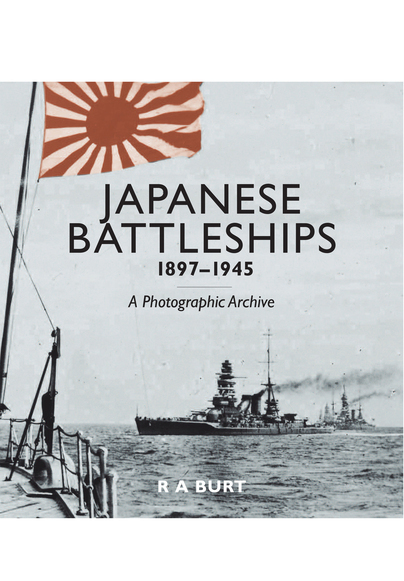 If you are into Japanese Battleships from before and during the Second World War, you will enjoy the entire collection of archival photographs in this book! The book also serves as a great referencing tool for the scale modeller. This book is quite special as images of Japanese battleships are very rare... The book is slimmer than I expected but the rarity of Japanese warship images confirms that this book is comprehensive and we can never doubt the quality of the text from an author of this calibre... As ever we are treated to a large amount of information in addition to some genuinely splendid archive imagery. Each ship class is supported by adequate technical details with informative captions... 'Japanese Battleships 1897-1945 should be on the bookshelves of students of armoured ships and their place in 20th century sea power.